Your challenge when you come to your emotions is to pay pinpoint attention to what your emotions are actually telling you, your interpretation of and not the sense of the emotion. The more you practice and win the more you fill your emotional atmosphere with the positives that you need in other areas. 1) M stands for Motives or your-motives. 2) PI stands for Personal Identity or your-personal-identity. 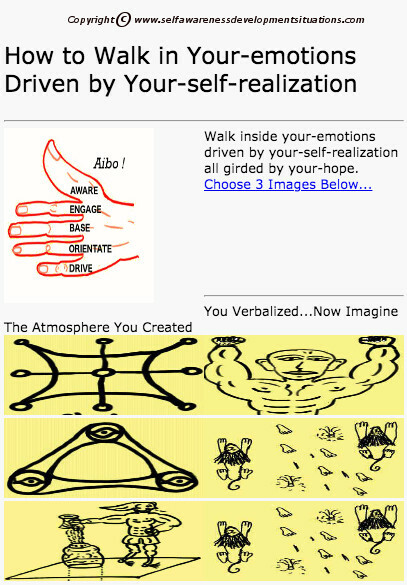 3) E stands for Emotions or your-emotions. 4) SR stands for Self-Realisation or your-self-realisation. 5) H stands for Hope or your-hope. 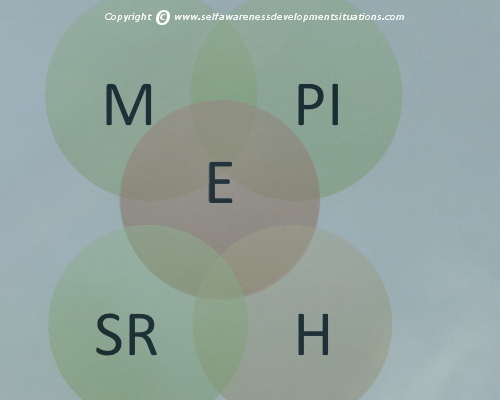 Use the above to construct the following spheres that show the linkages between your atmospheres. E is at the center! What is Implied By The Above? 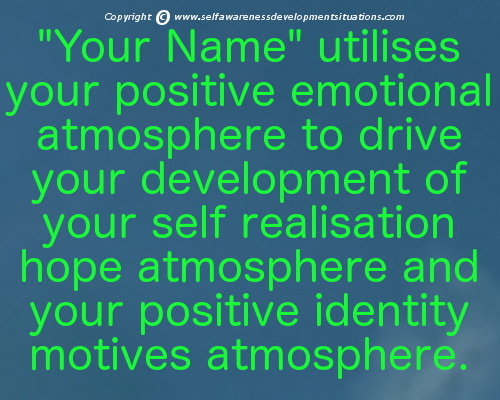 Your emotions-self-realisation-hope atmosphere has an interesting intersection with Your Emotions-Personal-Identity-Motives atmosphere in that both share your-emotions atmosphere. The uniting sphere between the two venn-diagramed atmospheres, so to speak, is your-emotions. So your emotions tend to link your personal identity motives with your self realisation hope. In this context your-emotions play a crucial connecting role. You could make a number of conclusions about the positive role of your emotions atmosphere from this interlinkage. As a self-leader you could conclude that you need developed emotions to drive your self realisation hope - the hope that you, for example, will realise your-purpose or your-goals that you set out to do. Note: Replace The Words "Your Name", "Your", "You" with Your Actual Name and Then Verbalize It!